Pinguicula bissei with reddish to white flowers and Pinguicula caryophyllacea close to P. benedicta with pink to deep red flowers. More in the species area. January 2004 : A new species of Pinguicula may be published by Hans Lurhs in the next years : it is a species found in Zaragoza, in Mexico that is grown by Stan Lampard. It was known as a subspecies of Pinguicula immaculata but finally different from this species. The possible name published should be P. nivalis. I thought that these plants were only grown in Stan Lampard and Hans Luhrs 's collections but Jan Flisek sent me the following information : " These plants are grown in Miloslav Studnicka's collection too. He got the plants from Japan (Mr. Hattori) in 2000 ". (information sent by Oliver Gluch and Jan Flisek). January 2004 : After so many year of studies, the publication of the hairy population of Pinguicula from Sierra Tamaulipas, published under the possible name of Pinguicula pilosa was sent to the ICPS board and may be published in a next CPN issue. More soon. (information sent by Oliver Gluch). S.J. Casper & A.J. Urquiola Cruz: " Pinguicula cubensis (Lentibulariaceae) - a new insectivorous species from western Cuba (Cuba occidental)" ; Willdenowia 33 (2003), S.167-172. 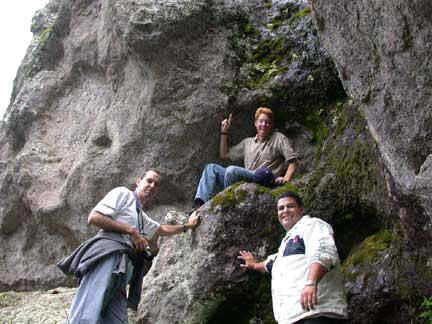 The famous Dr. Fernando RIVADAVIA is happy to share all his Mexican trips in the article area. May 2003 : Just a quick message to tell you that two new species of Pinguicula, have been described from Cuba by S.J. Casper. April 2003 : Have you heard about Pinguicula calderionae ? It is a new Mexican species from Queretaro and San Luis Potosi states (on the border between the two states). Summer leaves are very long and shaped like Pinguicula moctezumae with leaves that reach 26 cm ! and winter rosette is shaped like an onion of a diameter of 1 cm only ! - Pinguicula from Sierra Obscura : we bought (6 persons) some plants for a golden price in Australia and wait for the delivery in October. - Pinguicula grandiflora f. chionopetra : I have 3 small plants from a Pyrenean moutains population with really white flowers like the one from Ireland. This species will be soon available at NATURE ET PAYSAGE carnivorous plants nursery for a cheap price. - Pinguicula variegata : 100 plants in-vitro, coming from the seeds of Hiro Shimai and in culture in my Friend Laurent Legendre's greenhouse in Australia. - Pinguicula calyptrata : I have been given 1 plant this week-end given by a good and skilled friend J.J. LABAT, owner of the famous carnivorous plants nursery NATURE ET PAYSAGE. - Pinguicula elizabethiae : 5 young cuttings in Germany are under good care. - Pinguicula benedicta and Pinguicula albida, two species from Cuba are also in Germany under culture. Unfortunately, we don't have germination yet of the seeds of Pinguicula elongata given by Joe Griffin. - February 2003 : The famous Mexican Botanist Dr Sergio Zamudio published in 1999 a new Pinguicula species belonging to the section Orcheosanthus. The plants comes from Arroyo Toliman and Rio Moctezumae (Area also hosting P. moctezumae) in Queretaro and Hidalgo Mexican states. It is Pinguicula elizabethiae. See P. elizabethiae page. - January 24th 2003 : It seems that Dr Zamudio described a new Pinguicula under the name Pinguicula conzattii. It is the Pinguicula population discovered by Dr Alfred Lau in Santiago Nuyoo Pass in Mexico and grown under this name worldwide. - January 2003 : update of the Pinguicula mesophytica seeds story : two seeds have germinated in-vitro in ...Australia. I gave half of the seeds to Laurent Legendre in Australia and the other half to a carnivorousplants nursery in Europe. On March 2003, the two plants are still alive !. "In Sancti Spiritus, Cuba, september 24th, a new location for Pinguicula jackii have been discovered in "Cuatro Vientos" area, near Topes de Collantes. This species was found by Alexander Romero Emperador and Blas Perez Silva, of the Foundation Antonio Núñez Jiménez of the "Nature and the Man". Romero declared that previously single had been reported in a place known like Buenos Aires, in the Mountain range of the Escambray and in the new area a colony of four plants exists. The Pinguicula jackii, endemic of mountains of the Escambray, is a plant of 15 cm.diameter, was discovered in 1944. " This is a good news because this species was known to be extinct in wild : Paul Temple didn't find any plants in the only known location. - December 2002 : A wonderfull undescribed species can be found in the Sierra obscura. It is sold in Australia (Triffid Park Nurseries) under two names : var typica and var Chihuahua. According to Alfred Lau (the discoverer and seeds sender of this species), all are from the same location. See the page. - December 2002 : I have received some precious seeds of Pinguicula mesophytica. - August 2002 : I have been informed that Pinguicula chilensis have arrived in a collection somewhere in Europe. Do you know where ? I hope that, one day or the other, this plant will be available somewhere. - 2002. A new species not yet published have been discovered in Abbruzi, Italy. After Pinguicula fiorii and Pinguicula poldinii, this will be the third new species described in the recent years years in Italy. Is Italy becoming a new hollydays destination for Botanists ? - Summer 2002 : Some Pinguicula grandiflora f. chionopetra have been detected in the Pyrenees mountains in France. This allows to conclude that this form is no longer endemic of County Kerry in Ireland. Can we miss this second opportunity to start growing this plant ?